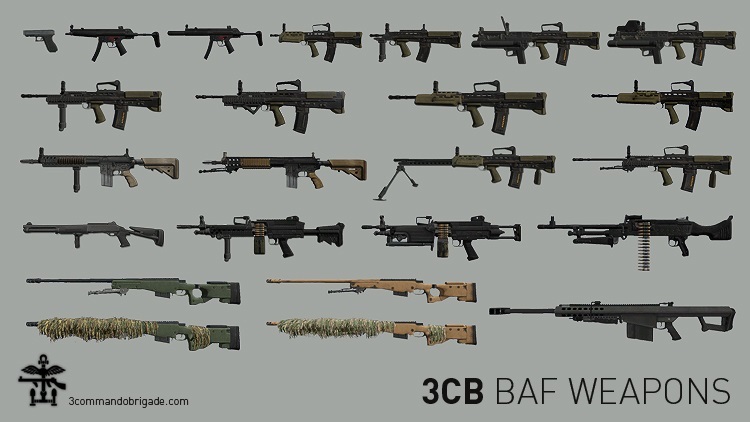 This pack now contains almost all of the rifles used by the British over the last few decades, including many of the variants produced as the weapons were developed or evolved. There are a number of authentic scopes, customised ammunition, plus many ‘rail’ accessories to complete the picture. The pack uses a combination of models drawn from various sources including custom designs from 3rd parties who have kindly given their permission, including Blackpixxel’s AT4, Da12thmonkey’s RKSL scopes, Kiory’s L85, Stalker’s L129/TA648, Tigg’s L119 and E-Mag, Toadies L1A1, L115, L118 and L110,and Vila’s foregrip, as well as our own in-house mod team. 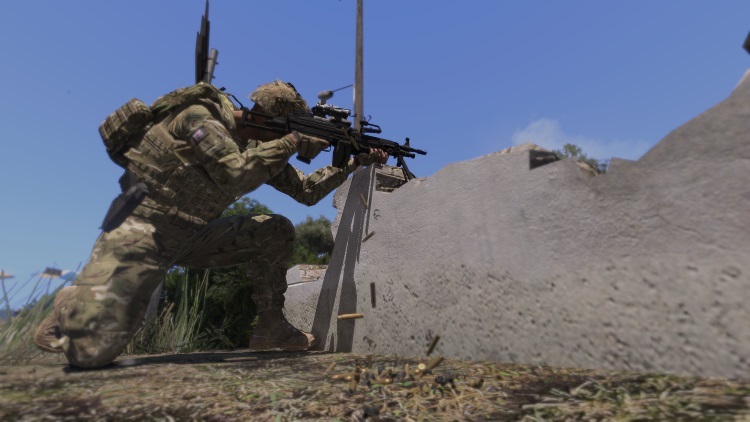 We have added, improved, updated and refined where required, particularly putting in significant effort to configure the weapons accurately using Bohemia Interactive’s latest Marksman DLC update, to include muzzle velocity, inertia simulation and deployable bi-pods. Sounds have received some love too, integration of LAxemann’s new sound framework. And finally our texture artists and animators have been hard at work to present an accurate replica of the visual appearance. These weapons are fully compatible with @Ace3. The Javelin is completely customised, with a separate Command Launch Unit and Tube which can be assembled, fired and the empty tube discarded. Check the Operational Notes for instructions on use. The static weapons have been moved from our equipment mod, refined and extended. Packed into bags carried in the launcher slot, a small team can assemble the tripod and barrel into a formidable static weapon. Be warned though; some of these weapons are extremely heavy and will sap your stamina to carry them any distance. The L7A2 GPMG static weapon is slightly more versatile, in that once disassembled the GPMG can still be carried and fired as a primary personal weapon, with the tripod packed in a bag and carried on the shoulder. Each of the HMG, GMG and GPMG tripods can be set to Low, Mid or High positions to suit the deployment terrain. Other additions include blank fire adaptors, blank ammunition including grenades, switchable Laser Light Module, Glock flashlight, HEDP grenade rounds, SUSAT scope zeroing and more. 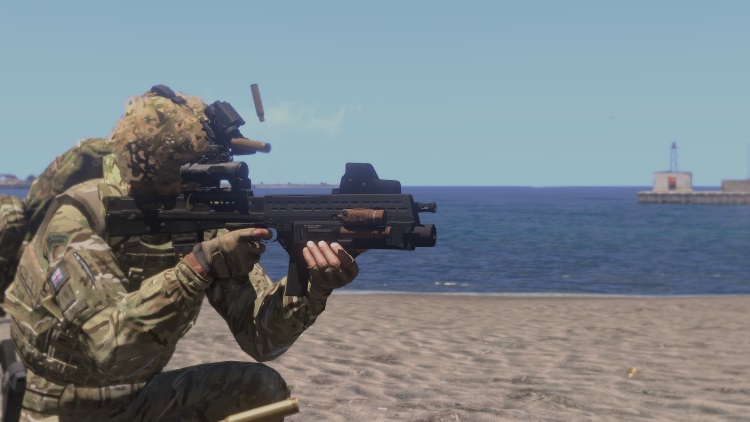 We thank the original authors who have allowed us to use their models and hope that the ArmA community enjoys using these weapons as much as we do. Having trouble getting your scopes to work in advanced ballistics it just reverts to basic vanilla zeroing and not scope adjustment mildots I’m guessing this is just due to the huge ace update that happened recently ? Hello, im having problems with this mod, whenever i try to load this mod i get the message ** Addon ‘UK3CB_BAF_Weapons’ Requires addon ‘A3_data_F_Loadorder’**. Im not sure what im doing wrong, this mod says it has no addon requirements. Wondering if there are any plans to convert the GPMG into its indirect fire/map predicted mode? Is such a thing possible or is there already a mod?